Canada has launched a new emergency alert system to notify their citizens of important information. The problem is, instead of using it as an opportunity to build a new and better system suited for the digital age, they've recreated the decades old system already existing in the US. Before I continue, I want to make it clear that I'm not against the alert system. There's a lot of value in building something this important based on a system that's been reliably operating for a long time. But there are a number of problems and missed opportunities. Essentially, it's a system that allows information regarding "threat-to-life" or "threat-to-property" situations to interrupt normal programming on TV and Radio. (Although media is allowed to broadcast alerts with their own staff on their own schedules instead of interrupting programming immediately.) 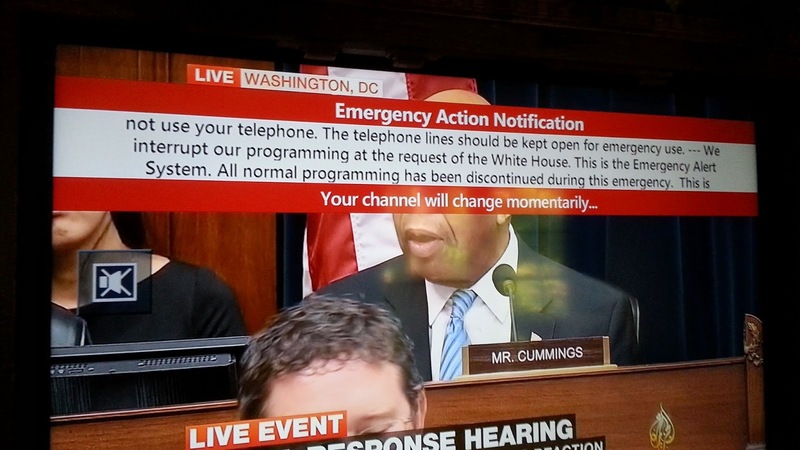 While many notices are sent out daily, only the most important events are flagged to interrupt service. Extra content, like press releases, pictures and maps, can be included in these alerts for news staff to manually upload to websites or push to social media. Weather emergencies from a tornado or flood. Man-made disasters like a plant failure, chemical spill or train carrying dangerous goods. What about "Worst Case" ? Unfortunately, there are no regulations or financial support to ensure broadcasters choose the more expensive satellite receivers, which would work if internet was out. This means many radio stations won't have access to the system in these kinds of scenarios. Text-messages could be sent to anyone connected to towers in the emergency area. Pictures could be included in situations like an Amber Alert. Could you image if everyone around a mall suddenly got a picture text message of a missing child? Browser injection can be used to insert banners around a website you're browsing. This could include text, photos and links to details. Games could be interrupted or a banner could appear on the TV with the alert message, much like an alert would interrupt regular TV. Partnerships with Major Websites like Twitter, Facebook, YouTube, Netflix, etc. Facebook already injects notices to ask for disaster relief money in situations like Haiti, Japan and Nepal. This could also be a proactive system. Streaming services could interrupt themselves, again, much like conventional TV. Social media could even ask people in affected areas if you're OK to notify worried friends and family. Websites also know the area you're connected from and could target alerts properly. Obviously, each of these scenarios introduce more questions, but to not even be interested in looking in to it? I don't support conventional TV like I support radio. Is it required in an emergency plan? Absolutely. But it's no more deserving than the digital methods I just listed. (Probably less so - I'm sure digital media and games can reach more people with more speed than cable / satellite TV.) If the argument against digital options is "What happens when power is out?" then I say, "TV won't work in that scenario either." If asked, "What if cell networks are overloaded?" then all the more reason to reach out with every possible avenue. If you're looking for more information on what's going on and power is working, you're probably going to turn to internet instead of TV. 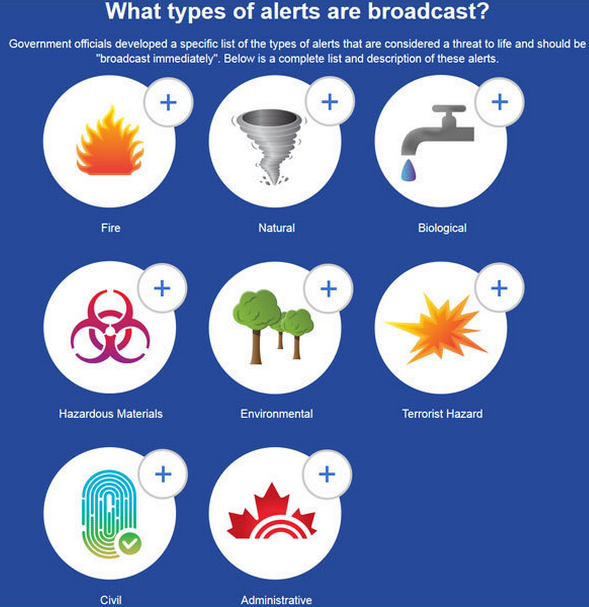 Can I get Alert Ready alerts on my smartphone or wireless mobile device? At this time Alert Ready alerts are not automatically broadcast directly by wireless carriers. However, some companies and government agencies do provide text messaging or mobile apps on a subscription basis that support the delivery of alerts. Maybe it's just me, but all those digital options of communicating with people just make sense. Instead, despite The Weather Network already having software you can install on PCs, phones and tablets, which do pop up weather alerts, the only one that advertises "public safety warnings" is a text-message system you have to pay for. Let me rephrase that - If you want to be immediately notified of a threat-to-life situation in Canada, you have to pay a monthly subscription fee. Implementing what is essentially a cold-war era* emergency alert system that won't reach the majority of the public in a timely manner and may not even function in a worst case scenario is a missed opportunity when you consider that we easily have the technology to reach almost everyone today. It's a good first step, but nobody I spoke to was interested in looking forward at step 2. Radio and TV companies were forced via regulatory requirements to purchase the equipment to put these systems in place. Partnerships with websites and gaming services would be icing on the cake, but the government also regulates phone and internet providers. Not properly utilizing cell phones in todays world is a glaring error in the dissemination of critical information. * Yes, the back-end is more feature-rich than cold-war systems, but as for what interacts with the public? You're still just relying on the Radio / TV you have to already be listening to / watching to be interrupted. For more information on the system, geared toward the public. Links to individual provinces preparedness resources. Parent company of The Weather Network and the people in charge of the alert system. Explore the alert RSS feeds they make available and look at archived alerts. The XML feed uses the tags "polygon" and "geocode" to draw lat / long and tag areas that are affected. These RSS feeds are VERY spammy without a proper aggregator because of the way updates are sent out. Links and Resources for hardware vendors and developers. Receive weather notifications on your PC / devices. Only the NOW text-message subscription advertises that it sends public safety warnings. Most cell phones have an FM receiver and both Apple and your provider have turned it off. Next Radio can play free over-the-air radio on some Androids with some carriers. In an emergency situation, this could allow every cell phone to receive important information, but you're not allowed. An app with a map of hydro outages in Ontario, Canada and rough details on each. Often shows details for hydro outages not covered by Hydro One service. Besides, ascertain to find an emergency dentist nearby to your area, as it will help you get immediate treatment for the dental crisis. For complete protection of UFC Fight Night 136, take a look at the UFC Events section of the site. The Blue Corner is MMAjunkie's website area. We do not take it too seriously, and neither should you. Should you come whining to us that something which you just read isn't hard-hitting news, expect to have the previous sentence replicated in ALL CAPS. Site created and template modified by Dave G.
*Disclaimer* Issues that I might detail here shouldn't reflect negatively on businesses. Technology doesn't always like to behave the way it should, so there's never one solution to a problem, and just because something works for me, doesn't mean it'll work for you. Even though you're following a tutorial, you should still be knowledgeable with the equipment / area you're working on to take the advice here - mistakes in very technical areas can cause lots of damage to sensitive equipment and configurations.